Cats And Other Animals Used In Genetic Research Gain What Novel Ability? Monkeys, cats, mice, and other mammals used in genetic research gain a particularly novel genetic trait as a result of techniques used in the experiments: they glow in the dark. 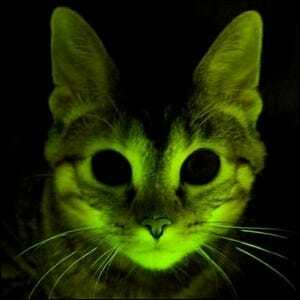 How exactly does study into genetic research unrelated to imbuing cats with glow-in-the-dark talents, yield just that? It’s a side effect of the processes used. In order to effectively track the animals, scientists insert genes into the experimental animals that have nothing to do with the research but can be used to track them and the changes in their offspring. For mammals, one of the most commonly used genes is that from a jellyfish as it has such extremely low potential to compromise the experiment. One of the side effects of using genetic material from a jellyfish, however, is that the animals–be they cats, mice, or other research animals–fluoresce under ultraviolet light. In the late 2000s there was a surge of interest outside the research community, especially in Japan, for pets genetically modified glow.